BENGALURU, India; April 20, 2017 – Accenture (NYSE: ACN) and Akshaya Patra, the world’s largest NGO-run Mid-Day Meal Program, collaborated on an innovative project that used disruptive technologies to exponentially increase the number of meals served to children in schools in India that are run and aided by the government. The “Million Meals” project revolutionized Akshaya Patra’s supply chain and operations, resulting in improved food quality and expanded service reach. Rooted in a vision to eliminate child hunger, the “Million Meals” project demonstrated how disruptive technologies such as artificial intelligence (AI), the Internet of Things (IoT) and blockchain can help address significant challenges in mass meal production and delivery. Accenture Labs, the research and development arm of Accenture, executed the project over a period of six months in Akshaya Patra’s Bengaluru kitchen. An analysis of the project indicated a potential to improve efficiency by 20 percent, which could boost the number of meals served by millions. Akshaya Patra’s goal is to continue to optimize and streamline the program. Accenture Labs began the project with a strategic assessment and design thinking, then developed a prototype for improving kitchen operations and outcomes. Technologies were then applied to four critical processes: collecting school feedback, tracking food delivery, measuring the quantity of food and supplies to be purchased, and monitoring meal production. As a result of these process enhancements, Akshaya Patra improved their audit capabilities, attendance recording, invoice processing and payment, order and data collection, and food preparation operations, allowing for expanded production capabilities and establishing a blueprint for operating other kitchens. An example of Akshaya Patra’s transformation was its move from manual collection of feedback from children and schools to a more efficient technology-based solution. Using blockchain and sensor-enabled devices, the technical team gathered feedback digitally, leveraging AI technologies to predict the next day’s meal requirements. The team tracked the timeliness of food delivered to each school involved in the initiative and collected the data using mobile devices and an Accenture-built system. The team also used IoT sensors to monitor and sequence the cooking process to ensure optimum energy consumption and consistent food quality. This system not only aided in tracking kitchen performance but also provided accurate, real-time data to identify trends, make better informed decisions and save valuable time and effort. The Akshaya Patra Foundation is a not-for-profit organisation headquartered in Bengaluru, India. The organisation strives to fight issues like hunger and malnutrition in India. By implementing the Mid-Day Meal Scheme in Government schools and Government aided schools, The Akshaya Patra Foundation aims not only to fight hunger but also to bring children to school. Since 2000, the organisation has worked towards reaching more children with wholesome food on every single school day. Akshaya Patra Foundation is continuously leveraging technology to cater to millions of children. Its state-of-the-art kitchens have become a subject of study and they attract curious visitors from around the world. In partnership with the Government of India and various State Governments and inestimable support from many philanthropic donors and well-wishers; Akshaya Patra has grown from humble beginnings serving just 1,500 school children across 5 schools. 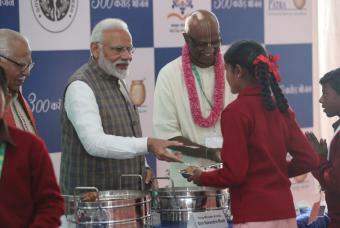 Today, Akshaya Patra Foundation is the world’s largest (not-for-profit run) Mid-Day Meal Programme serving wholesome food to over 1.6 million children from 13,529 schools across 11 states in India. Accenture is a leading global professional services company, providing a broad range of services and solutions in strategy, consulting, digital, technology and operations. Combining unmatched experience and specialized skills across more than 40 industries and all business functions – underpinned by the world’s largest delivery network – Accenture works at the intersection of business and technology to help clients improve their performance and create sustainable value for their stakeholders. With approximately 401,000 people serving clients in more than 120 countries, Accenture drives innovation to improve the way the world works and lives. Visit us at www.accenture.com.